Disclaimer: This is an independent, unsolicited review. I am not an employee or affiliate of Libby's. 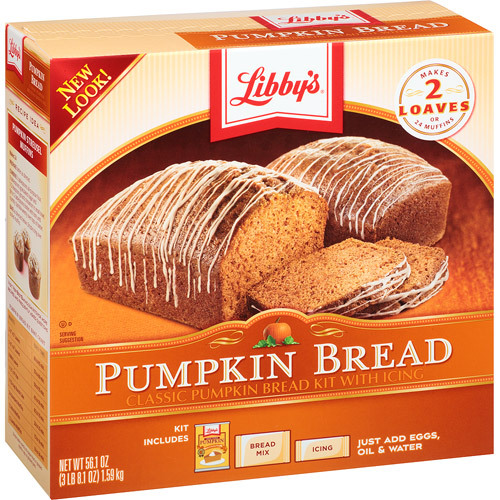 When you want something that tastes like you spent several hours in the kitchen but actually takes about ten minutes to mix up and pour into the pan of your choice, look no further than Libby's pumpkin bread. Good enough to take to a potluck and easy enough to whip up as a breakfast bread or dessert anytime. I wanted to test it in my Gourmia on the fruitcake setting, as I've only used the basic setting on the Gourmia thus far. 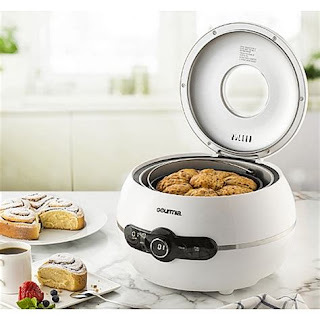 However, the ingredients fill the Gourmia's inner pan to the brim, so I ended up using a 9 x 13-inch cake pan lined with Reynolds Wrap and sprayed with Pam Butter Flavor Cooking Spray. There is a wonderful hack which my son found in his Tumblr feed to make any cake mix extra rich and moist, and I have been using it for the past year. Add one egg to the number of eggs called for on the mix box. The pumpkin bread mix calls for four eggs. I used five. Use milk instead of water and melted butter instead of cooking oil. It's an easy trick to make a good thing even better. Pour the pumpkin bread mix into your chosen pan(s). Then comes the hard part: the wait. In a 9 x 13 pan, the bread/cake cooks for 50 minutes. I then let it cool for an hour before putting on the icing. I didn't do the pretty drizzle depicted on the box. I squeezed the icing into the middle of the cake and spread it all over with a knife. After an hour of cooling, the cake is still warm enough that the icing will melt into the top but not throughout the entire cake. I could have waited for the cake to cool a bit more, but that would be masochistic. I cut myself a generous piece and enjoyed every morsel. Libby's pumpkin bread mix is cost-effective, easy to prepare, and delicious. It will be a staple of my breakfast bread and desserts list from now on. Tech Tricks: Help! My Login Screen Won't appear!